Mother’s Day is a holiday honoring motherhood. It is observed in different forms throughout the world. This year, Mother’s Day 2018 occurs on Sunday, May 13, in the United States. The first American Mother’s Day was created by Anna Jarvis in 1908 and became an official U.S. holiday in 1914. While dates and celebrations vary, Mother’s Day traditionally involves presenting moms with flowers, cards and other gifts. 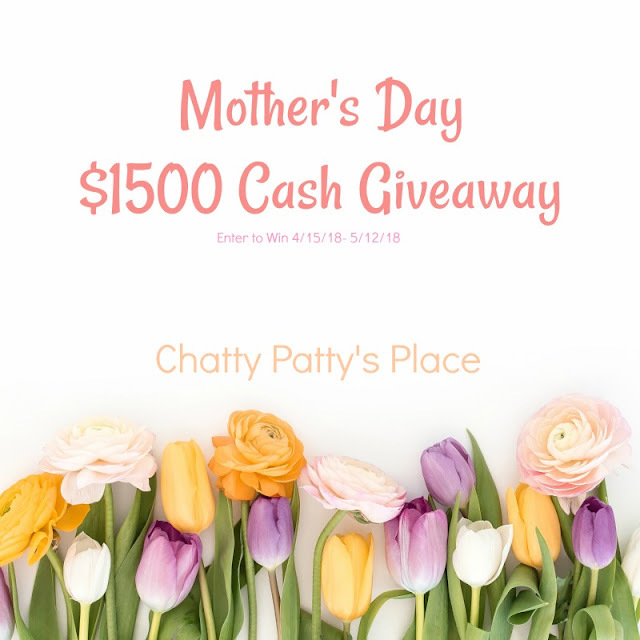 Speaking of gifts, how would you like to a chance to win $500 so you can pamper your special Mother figure(s) in your life? Enter below! 3 winners will each receive $500 via Paypal or Amazon gc. This giveaway is being hosted by Full Live Reviews. Winner will be chosen by them. I hope you and your families have a wonderful Mother's day! Good luck! Terms and Conditions: Giveaway will open on 4/15/18 @12AM EST and end on 5/12/18 @11:59 PM EST. There is one mandatory entry with multiple bonus entries. Only the mandatory entry needs to be completed in order to win, however the more bonus entries completed the more chances you have to win. There are daily entries as well. Must be 21 years or older to win. Three (3) winners will win $500 Paypal cash or Amazon GC. Entrants must complete entries and each winning entry will be verified. If selected winner does not complete or verify entry a new winner will be chosen. Winners will be notified no later than 5/15/18. Winner will be emailed and must respond to claim prize within 48 hours via the email they signed into the widget with. If winner doesn't respond within 48 hours a new winner will be chosen. Once winners have claimed prizes they will be announced on the Winner's Circle page and sent to co-hosts. Void where prohibited. Chatty Patty's Place is NOT responsible for prize distribution. Winners are chosen by, and prizes are rewarded by Megan Ross of FullLivesReviews.com. Please visit http://fulllivesreviews.com/winners-circle/ for winners list. I'm not sure what I'm doing for Mother's Day this year. My late husband would get me a card every year and we would spend the day with the kids. This year will be my 1st without him. I will hopefully see my Mom and Mother In Law. My favorite Mothers Day tradition is my two grown daughters always bring me an assortment of Annual flowers to plant. They know I love it so much. My mom passed a few years ago but I always enjoyed taking her out for lunch. I learned they offer discounted pricing to those that are active or retired public service employees and to approved customers that have a limited income. We use to do brunches too. On Mothers Day we usually have a BBQ in my parents back yard. When i was younger we use to go to my grandmother's and BBQ on Mother's Day. My Mother has past but when she was living I used to take her out for a nice dinner and get her a hanging flower basket for her porch. Mine has past as well. I hope happy memories fill your Mother's Day, Kathy. My mom loves chocolates so I takes her Hershey's every year. She is 87 years old and still at home continuing to raise great-grandchildren. I love visiting Hershey. The smell of chocolate in the air is wonderful. One of my faorite Mothers Day traditions is to take mom out for a Girls only day, get our hair done, have lunch out somewhere. Have you ever made breakfast for your mom on Mothers Day? It's a family tradition. Another nice Mother's day tradition is a family photo, with all the kids on their best behavior. A fun traditional Mother's Day Dinner cruise is a lovely way to say I love you mom. When my mom was living, she'd be treated to a nice meal out and flowers. As well as a day just being driven around to see the sights. I love touching base with my mom. Our family doesn't really have any "traditions"; maybe as my kids get older we'll make some. My nephew and I take my mom out to lunch every year, she raised him as well. Our tradition is going out for brunch. I used to get mom a beautiful hanging basket for Mother's Day. I miss her very much now that she's gone. Awww, I know how you feel. I learned that Enzymes Assist with Digestion of Proteins, Carbohydrates & Fats. My mother doesn't really care, as long as someone acknowledges her that its Mother's Day. Just a card suits her. We go to a special brunch on Mother's Day. Favorite Mothers Day tradition is taking Mom out to dinner. Mother's day tradition favorite is to have the kids in the family make craft items for mom- like beaded bracelets or necklaces. My favorite Mother's Day tradition is getting treated to breakfast by my daughter. Thanks for the giveaway! I learned that Daily Body Restore is tested by Labdoor for sport. We go out to eat lunch or dinner. We always go to a local brunch on Mother's Day. A favorite tradition is to have pancakes on Mother's Day, like maybe at a Pancake place. We like to take long walks on Mother's Day and look at all the pretty flowers. If the weather is nice and sunny, we would have a Mother's Day picnic. Mother's Day gives us an excuse to have Mimosas at brunch! I enjoy calling my mother on Mother's Day. After our brunch, the whole family gets together and we all just hang out. I love going out to my Grandma's for a family day on mother's Day. I love that my kids come over and the grandkids. We have a cookout and enjoy each others company. My birthday and Mother's Day is a week a part. Usually, Mother's Day I get cards from my children and grands and end up celebrating both days with gifts and dinner with my children and grands. We will be in the city SF this year celebrating with my mom. This coming mother's day, I plan to send flowers and a candy/ Fruit basket - it's a lovely tradition to start for Mother's day. We still like our Mother's Day brunch! The celebrations may vary, but the emotion and love that ties families together is the same the world over. Mother's Day, no matter how or when it is celebrated, simply serves as a reminder of all moms do for their families every single day. I like giving mum flowers as a tradition. On the Daily Body Restore website, I learned that they have a 3 for 1 offer for a limited time. Every year on Mother's Day, my kiddos (with the help of my hubby) make me a grand breakfast and bring it to me in bed. It is so sweet and I look forward to it every single year! One of my most favorite Mother's day traditions is to send a Fruit and Blooms basket, quite a lovely gift I know will be appreciated. I love Mother's Day- There's an elegant Jazz-fest Brunch happening next weekend, I think mom would love it. On Daily Body Restore website, I learned that their CEO uses their products. Thanks for the giveaway! Mothers day brunch is my favorite tradtion. We typically spend the day playing games together and/or baking as a family. Always a fun and special day. On Daily Body Restore, I learned that the product was developed by the CEO. We really don't have a tradition, but when my mom was alive, me, my daughter and I would always make a point to get together on this day. And we always had little gifts for one another. I get breakfast in bed and my children have gifts for me! I'll be attending a lovely traditional Mother's day lunch at our local Senior Center. On the Daily Body Restore site, I learned that product has 19 ingredients. Thanks for the giveaway! Mother's day traditions in my family include Waffle breakfasts- a favorite, because they're fun to make. Mother's day tradition is to go the historical gardens in my town after a nice brunch with my family. My Mother's Day tradition is being with family and calling my mom. On Daily Body Restore, I learned they have experts available to maximize your results. Thanks for the giveaway! If Mother's day falls on a Saturday, we go get our hair done, sort of a ladies day out. We always go out to a fancy buffet for Mother's Day! We don't really have any traditions about the day, but I remember fondly my mother and a fact of life with her. Her birthday always fell either on the day itself or within a day or two of it, and it was well known in the family that they were 2 separate things and woe betide anyone who tried to combine them in one gift or celebration! Weather is expected to be sunny and warm for Mother's Day- we may start a new tradition by taking a family walk by the river. My favorite Mother's Day tradition is going out to brunch. Thanks for the giveaway! I found this at ChattyPattysPlace.com. My favorite mother’s day tradition is no house work and no cooking at all that entire day!! Just mom time!! On the Daily Body Restore site, I learned that it has enzymes to assist with digesting carbs, fats, and proteins. Thanks for the giveaway! My favorite Mother's day tradition is going out for dinner! I love that we get together...daughters, grandchildren, husbands and explore someplace new. My favorite Mother's Day tradition is going to brunch. Thanks for the giveaway! On the Daily Body Restore site, I learned that there are 9 probiotics in one capsule. Thanks for the giveaway! My favorite Mother's day tradition is making home made chocolates with my mm and aunts. The regular Mother's Day was always going to church and then out for a meal. My favorite tradition was taking my mother and mother in law to the flower store and letting them pick out whatever they wanted. Unfortunately my mother passed several years ago and my beautiful mother in law passed yesterday May 8th less than 24 hours ago. I will miss both of them until I see them again. Thank you for this opportunity. 5/9 It is nice not having to cook so we go out to eat. I always send mom flowers for mother's day and we have a nice lunch one or two days before so we can talk and catch up. Many years ago I bought my MIL a British tea set and then every Mother's Day until she dies we would sit and have tea and cookies. My favorite tradition is taking Mom out for a nice dinner. My favorite Mother's Day tradition is going out for brunch. Thanks for the giveaway! On the Daily Body Restore site, I learned that there are 10 digestive enzymes in every capsule. Thanks for the giveaway! My favorite Mother's day tradition is going to church with my daughter. When my mom was alive it was always to church and then out for lunch. We go out for brunch or have a special meal at home. I like to give her flowers or a piece of jewelry - and if I'm in town, we go out to eat. Have a wonderful day April! I love dinner, dessert and movies with my family. My favorite Mother's Day tradition is spending time with my family on that day. No tradition. I just like to be with my famly. We just have a big dinner at home and avoid the crowds at restaurants. Taking my mother to the tea at the gardens. My favorite Mother's Day tradition is my kids making breakfast for me. My children all live hours from me in three different directions. Since they've been grown, we really don't have any traditions for that day. My favorite Mother's Day tradition is going fishing! Quiet and relaxing and full of sunshine. This year my two sons are taking me out for brunch. My daughter always gets me several flats of annual flowers for my window boxes. Don't really have one. I usually try to get her a gift but this year it won't be in time. I learned You can take Daily Body Restore® Probiotic Supplement with Digestive Enzymes anytime throughout the day either with or without food. We always take my mom out to some sort of fun brunch!! We always took my mother in law to brunch at her favorite diner and they used to give all mothers a carnation. We always either go out of breakfast or have donuts/cinnamon rolls. Our favorite Mothers' Day tradition is going out to brunch with my mom and grandmother. We usually go shopping for awhile as well. Its wonderful to spend time with them. We do not stick with a tradition as things may change a bit every year depending who is available. I plan on going to the mausoleum with my mom and grandma this Mother's Day to visit my great grandma who passed away a couple of years ago. This year we are going to make things easy and pick up food on the way home so that we can relax and watch a movie together while we eat. No cooking, no dishes. Giving flowers on Mother's Day is my favorite tradition. We go out for brunch or I get breakfast in bed. DBR: You get 9 probiotics & 10 digestive enzymes in 1 capsule. My favorite tradition is going to my moms house and making her breakfast every year! On the Daily Body Restore site, I learned that they use independent labs. Thanks for the giveaway! My favorite Mother's Day tradition is having the entire family go out to a Sunday brunch at the local hotel. Every Mother's Day my hubby and kids take me out for dinner! We usually have a brunch get together for all the moms for mothers day. Mother's Day itinerary for our family has always included Sunday Mass, followed by meeting family & friends for brunch at favorite resort restaurant..usually we make a visit to our respective grandmother's grave(s) that weekend, to place flowers, as well. We eat her favorite food and watch her favorite movies. I just love being able to spend some extra time with my mom on Mother's Day! I love the tradition of letting Mom sleep in. That's the best.